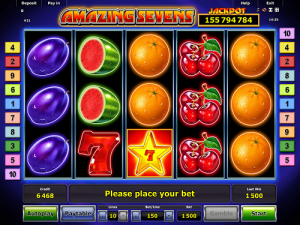 Amazing Sevens is a slot game from Novomatic. It’s fruity, it’s fun and it’s all about the sevens! There’s a jackpot in Amazing Sevens, which you’ll absolutely love to have your eye on. It’s progressive so you can see as the jackpot amount rising with every spin of the reels! There are five reels and ten paylines overall. The background is a simple, rich blue and the logo is red. The symbols are a mix of fruits and slot favourites, like stars, bells and of course sevens! 7 is quite a special number and it has significance in so many countries for so many things, including mathematics and religion. 7 is also considered by many all over the world to be a lucky number! That’s why you see it come up again and again, especially in casino games like this one. If you have two dice, 7 is also the most likely number to be rolled! Amazing Sevens has all of Novomatic’s typical features and music! The music in the background will sound familiar to anyone who enjoys Novomatic games. The individual reels can be heard clicking into place and the bell will ring loudly when you get a big win! This game is very, very good for a beginner to play. It’s so simple and easy to understand. The reels spin automatically when the autoplay function is enabled and you can also use the extra game to gamble your payouts after spinning winning combinations of symbols! Other Novomatic slot games which are similar to Amazing Sevens include: Amazing Fruits, Amazing Stars, Fruits n Sevens, Sizzling Hot Deluxe and Ultra Hot Deluxe. Amazing Sevens works like every other slot game! The aim is to match up the highest number of symbols as possible in a single spin. Matching symbols mean payouts! The symbols in Amazing Sevens include fruits, a golden bell, a red seven and a golden star (with a red seven inside). The fruit symbols are: cherries, oranges, lemons, plums and watermelon. Cherries will pay from two matches but the other symbols only pay from three or more. The payouts for each symbol are found on the paytable, and these will adjust themselves when you make changes to your bet. Your bet per line will equal the number of lines active (10 maximum) multiplied by your bet per line (5.00 maximum). Paylines pay from left to right and payouts are only given when the matching symbols fall on one of the active paylines. They also need to fall with no spaces in between them. So, the first matching symbol needs to fall on the leftmost reel and the others need to land adjacently, following the direction of one of the active paylines. After you get a payout, you can use the gamble feature to turn up the heat! The gamble feature will be loved by risk-takers! Use it for a 50/50 chance of doubling your payout. But be careful, there’s a 50% chance you’ll double it but also a 50% chance you’ll lose it! The golden star symbol, with a small red seven in the middle, is no ordinary symbol. This symbol is the Scatter symbol! Scatter symbols aren’t like normal symbols and the normal rules don’t apply to them! You can spin the Scatter anywhere on the reels and, as long as you get enough of them, they’ll do their job! In this case, the golden star symbol is the symbol that triggers the Free Games. When, in a single spin, three golden star symbols are scattered across the reels (in any position), the Free Games will begin. Guess how many Free Spins you get? Seven! During these extra unique Free Spins, all of the other symbols disappear to leave only sevens on the reels, along with blank spaces. This is fantastic as the red seven gives out the highest pays of all, so you’ll be getting huge payouts during these Free Games! As usual, you want the sevens (instead of the spaces) to land on paylines, consecutively, from the first reel on the left. The Amazing Sevens Jackpot will be awarded to you if you are lucky enough to fill every position on every reel with a seven symbol – no spaces in sight! The higher your bet is, the more of the jackpot you will win. When you play on maximum bet, you’ll be playing for 100% of the jackpot!